Who can order from your website? Do I need to setup an account to place an order online? I don't like placing orders online. When can I talk to a live person? Do you ship outside the Continental US? Are the colors accurate on your website? I tried to place an order several times but it did not go through. Now my credit card company says that I have been charged all those times. What is going on? I am confused by the pricing system on the Cove Base product menus. How are the Cove Base product pages arranged? I received a coupon / promo code. Where do I enter it? 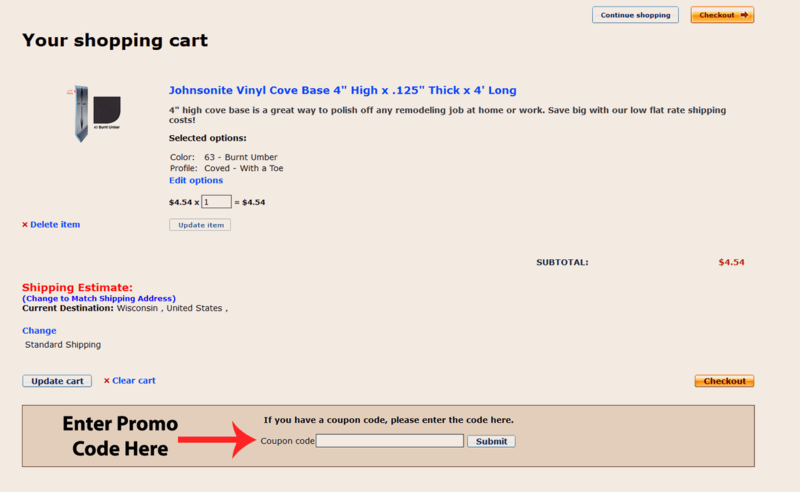 I tried to use a coupon code found on an online coupon sharing site but it isn't working. Why isn't it applying? 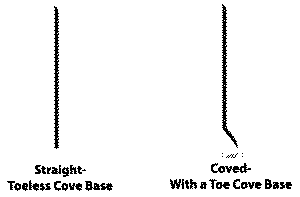 What is the difference between Straight -No Toe and Coved -With a Toe cove base? Why should I buy pre-molded cove base out-corners? Does your company just wrap the base around cardboard? I need a flexible transition strip. Will any of your transitions work? If you are uncertain if you have ordered the correct item or you have any further questions, you may always contact us at: 866.258.1554 or 608.244.1226, or E-mail us at: sales@installerstore.com. Please see our regular business hours below. We specialize in servicing the individual, but companies are more than welcome to place orders too. Most products do not have a minimum order amount, unless full case quantities are listed specifically on the product page. No, you don't need to setup an account to place your order. Setting up an account simply allows you to save your billing and shipping information, so you do not have to enter it on every order. An account also allows you to setup multiple shipping addresses, view previous orders, or request a RMA (Return Merchandise Authorization) Number. Customer service is available Monday through Friday, 8:00am - 5:00pm Central Standard Time. Call us: Toll free at 866-258-1554 or our local number 608-254-1226 (Major Credit Card Needed). Please see regular business hours above. Fax us at: 608-243-8240. Select this option at checkout. This saves your order, and allows you to print a copy of it. Then fax it in. Mail-In-An-Order: Select this option at checkout. This saves your order, and allows you to print a copy of it. Then mail it in to us along with a check or money order. ***Please Note: Orders DO NOT ship until payment is received. Yes, we ship to Hawaii, Alaska, and Canada, however you must call us to place an order. Due to higher shipping costs, the Standard Shipping and Warehouse Rush options are not applicable. Please call us, toll free at 866-258-1554 or our local number 608-254-1226, if you would like a shipping quote. Please see our Shipping & Returns page for this information. Due to the fact that all monitors show colors differently, we do not recommend that you go by what you see on your computer. Please contact us if you are looking for a specific color. Some of our items have color samples that can be sent to you. The Billing Address you entered does not match what your credit card company has on file. If you have moved recently, it may not have been updated by your credit card company yet.We have no control over this. Try using your old billing address to see if it solves the problem. Please remember that Billing Addresses & Shipping Addresses CAN be different. Your credit card was not issued in the USA. Our website will not accept orders outside the continental US. Please call contact us for additional payment options or for a shipping quote if needed. You are trying to use a gift credit card. Not all gift credit cards are compatible with gateway transactions (Online Purchases). Please call us, and we can try to manually process your card. Another option would be to use a normal credit card. When you attempt to make a purchase using your credit card, the transaction "Pings" your credit card account for the amount of the purchase, whether it is approved or declined. Since each attempt to make a purchase is considered a separate charge (This prevents sellers from initially charging one amount & then going back and changing that amount), this "Ping" tells the credit card company to reserve that amount for each attempt you make. If the transaction is declined, then these "Pings" will fall off your account approximately three business days after the attempt was made. The amount of time depends entirely upon your credit card company. We have no control over this. If you need these "Pings" off your account sooner, please call your credit card company and they should be able to manually remove them. To make our website more user-friendly, all colors available in specific Cove Base profiles are grouped together. 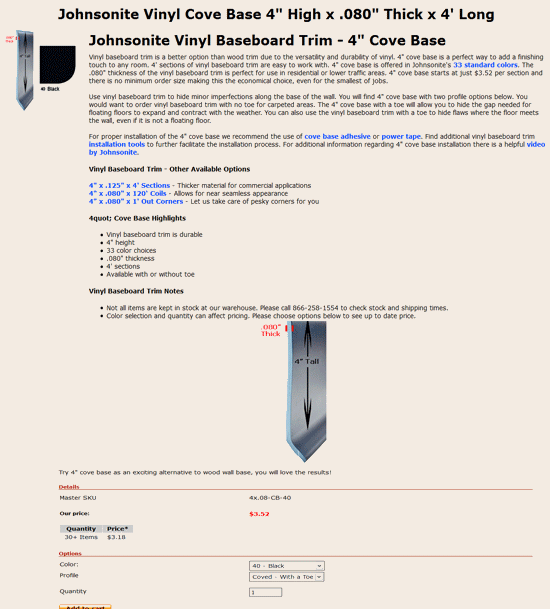 For example, all colors available in the Johnsonite 4" High x .080" Thick x 4' Long are listed on the same page. Once you find the height, gauge/thickness and length of cove base you need, you'll need to choose the color you would like to purchase from the "Color" drop down menu under "Options." Next you'll need to choose desired profile (with or without a toe). Not sure which profile you need? See below more more info regarding this topic. Lastly, you will need to type in the quantity needed to purchase. The price (shown in red above the drop down menus) is updated to show the correct amount. Third party coupon sharing sites are submitted by the general public and not Covebase-n-Transitions directly, and unfortunately they are not always valid. We strongly advise that you check any offers, discounts or coupons that you may want to use with our sales staff before trying to apply them with your order. All discount code/offer questions can be directed to sales@installerstore.com via email or call toll free 866.258.1554. Coved (with a toe) cove base has a small curved toe that comes off the wall about .45". The Coved (with a toe) is traditionally used with resilient vinyl and rubber flooring, but is the most commonly installed cove base profile. Straight (no toe) cove base does not have the curved toe at the end of the base, but instead extends straight to the floor. The straight (no toe) cove base is traditionally used with carpeted flooring. Using pre-made vinyl baseboard out-corners when installing cove base will save you time and headaches. We create the out corners here in our warehouse, so there is no minimum order quantities. Pre-made cove base out-corners are shipped wrapped around a piece of cardboard only to keep its shape during shipment. To view how we make our out-corners, view our YouTube video. The best flexibility comes from t-molding transition strips (must be installed with a track base). Both the aluminum and vinyl track base can be slightly curved. To increase flexibility, notches can be cut into/out of the track, and the more notches equals more flexibility. Please note: too large of a radius curve can cause the track base or t-molding to buckle. Slightly heating the track base with a hair dryer may help to increase flexibility. We only recommend our t-Molding transition strips and track bases for very gradual/gentle curves (approximate 1 foot radius for a 12ft section). If your transition radius is too sharp, bunching will occur on the inner side of the curve. We recommend requesting samples of track base and t-moldings if you have a curved transition. Please see above for sample request instructions.